Why iPhone app developer tap tap tap thinks Backpack is "invaluable"
tap tap tap's John Casasanta creates iPhone apps and recently published a list of tools that help the members of his “virtual” office collaborate in an effective way. He writes, "Out of all the apps and services I use throughout the day, I find myself spending most of my time in Backpack." 37signals’ Backpack has become an invaluable tool for our company. For each of our projects, we have one or more Backpack pages associated with it where we keep various lists and notes for the project. I say “project” versus “app” because we have several things in the works that affect more than one app (like social sharing, for instance). One of the things I like most about Backpack is its freeform nature and that you can easily adapt it to whichever way works best for you. There are many similar services that try to put too many constraints and restrictions on how you structure your information but with Backpack you have a lot of freedom in this regard. A Backpack page for one of our apps is very unlikely to look like one for another one of our apps and that’s a good thing… the teams are free to organize the information for each project in ways that best suit them and Backpack goes a long way in helping us do that. Learn more about how tap tap tap uses Backpack and other tools. David Lich struggled with the lack of full-featured, sync-able task and memo apps on the Palm Pre. He finally settled on a combination of desktop and mobile solutions including Basecamp and Backpack. He details how he puts it all together in "Getting Things Done on webOS with Basecamp and Backpack." 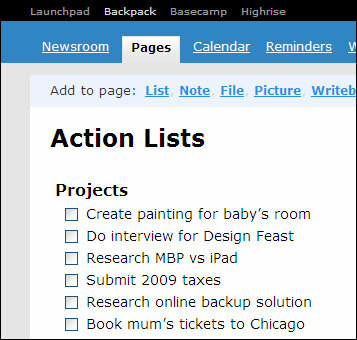 One of the great features of Basecamp is the ability to drag and drop items between to-do lists and within lists, and also reorder the lists themselves. I have created a to-do list called “PRIORITY” to which I drag items that I want to accomplish today. Backpack has a “Reminders” function that allows the user to establish individual and recurring reminders for specific dates and times. It can then be configured to send out an e-mail, text message or both at the scheduled time. I actually use both. I have an e-mail sent to my Exchange account, and have established a rule in Outlook to automatically move each e-mail with “Backpack” as sender to a separate “reminder” subfolder of my inbox. In addition, I have a text message sent to my Pre which, of course, shows up as a notification. It is truly hard to forget something when it now appears on my desktop in Basecamp, in Outlook in a separate inbox subfolder, and on my Pre as a text message with a notification. I’ll have no one to blame but myself if I somehow manage to ignore all of those reminders. Populi: "Campfire has all but replaced the reply-all email noise that used to plague the office"
Isaac Grauke is CEO at Populi, a company that makes web-based College Management software. Below he describes how his team uses 37signals products. We build software designed around a lot of the principles expounded in Getting Real and REWORK, principles which are all but absent in the college software market. Between our Sales and Development teams, our day-to-day work revolves around Basecamp, Highrise, and Campfire. Basecamp does a lot of heavy lifting at Populi. We use it to keep track of development and customer implementation, and to germinate a lot of our web marketing & support documentation. We group our development activities—whether tracking bugs & fixes, adding new features, improving old ones, and so on—into individual Projects. For instance, we have the “Dev General” project, into which we funnel a lot of the routine, across-the-board stuff (like bugfixes, optimization, etc.). Development projects that require special, focused attention get their own project—our recent Bookstore release was one such item. Implementation for new customers generally follows a particular pattern, so projects are a natural fit for that. When we sign a new college, we set up a unique implementation project for them, and plug away at it using milestones and to-do’s. The various writing projects at Populi fit in under Documentation (official stuff like Terms of Service, help documentation, internal company docs) or Website (marketing text for the external site, as well as look & feel code updates). Obviously, these projects are heavy on the Writeboards and To-do’s. Comparing different versions of copy in Writeboard makes it sooo simple to update website text or giant docs like the Terms of Service. Highrise manages our sales leads and correspondence of note with existing customers. It has been a tremendous help to our sales staff; previously they used a half-hearted combination of Salesforce and an internal Populi checkout. Salesforce had a zillion features that didn’t do anybody any good; Populi is built for colleges, not salesmen. Highrise handles everything we need it for with ease — even the guys here who only rarely need to look at it find what they’re after within a few seconds. Campfire is where we discuss a lot of the stuff that’s going on in Basecamp and Highrise. If someone has a question or issue or idea that’s worth the entire company’s feedback, it goes there first. Also, it has replaced internal email for sharing links (work-related and otherwise). For our internal discussions, it’s so much better than what we did before—reply-all emails, individual chats, meetings and mini-meetings—that it’s hardly worth comparing them. The Populi team hunkers down with REWORK. The 37signals apps are a great fit for Populi and how we like to do things. Being in the web-based software business ourselves, that aspect of the apps is just a no-brainer for us. Since we have a rather “informal” company culture, we have no need to chart how robustly we leverage synergies to get maximum ROI. The apps do pretty much what we need them to do. They replaced a lot of software — besides the stopgaps that Highrise replaced, Basecamp did away with an old TRAC system for development and a barfbag of shared folders and documents for our other uses, and Campfire has all but replaced the reply-all email noise that used to plague the office. One surprising thing about the apps is how easily they let us tweak or adjust our workflows. As I write this, we’re considering some significant changes to how we organize Development projects, and one thing we’ve noticed is that Basecamp will make that process short and virtually painless. Adam Fitzgerald is Managing Director at The Frontier Group. Below he tells us how his team uses Highrise and Backpack. The Frontier Group (based in Perth, Australia) develops web applications and web sites for startups through to big business. A team of 12 (and growing), we develop almost exclusively in Ruby on Rails now and love all things Agile. We run the Ruby On Rails meetup group in Perthand are well integrated into the local Rails community. Why do you need 37signals products? At the moment, the two 37signals applications we get the most out of are Highrise and Backpack. We have enough customers to warrant the use of a CRM, but need something with a low barrier to entry (otherwise it’s just another behemoth web application we need to maintain). We run simultaneous projects, so Backpack helps out there with keeping our information in one place. How do you use the product and why do you like it? Highrise: With Highrise, it’s all about Deals for us. Every lead goes in as a deal and we monitor the Pending list closely. We can track our Wins vs. Losses, but keeping things moving on Pending Deals is critical. Being able to set Tasks to ensure follow-up means our Deals don’t fall behind schedule. The email dropbox facility means all correspondence and proposals sent can be filed against the Deal, keeping everything central. Simplicity and ease of use is the reason why we introduced Highrise into our organisation. Fitzgerald: "It's all about Deals for us." Backpack: This is critical to keep all project documentation together. We might have four or more people needing access to documents for a project, or just loosely planning some ideas, so it all goes into Backpack. Another use for Backpack is management meetings. We meet once a week and have a Backpack page where the managers tick off deliverables from the following week and assess the week ahead. It’s not terribly formalised at this level, but it gives us a quick idea of where we’ve been and where we’re headed. Anything that makes a meeting more enjoyable is a plus. We were using Google Docs for project file management. That works ok, but is a little bit rudimentary with its interface. For us, it was either develop something in house, or go with Backpack and Backpack worked for us. Tell us a story about a time when the product(s) helped you out. Despite the simplicity of the 37signals applications, there’s still a lot you can uncover to use them for. We tried introducing Basecamp into our organisation a few years back but it wasn’t quite the right fit at the time. A couple of years later we found a small use for Highrise and Backpack, and it worked for us then. For people unsure of how they will use the applications, just focus on one area that works and then expand from there.